Jade McKinley left her small hometown of Chapel Springs to pursue big dreams in the city. When something terrible happens, she packs everything and decides to return home. Meet Daniel Dawson, the guy who has been like a big brother to Jade since she can remember. As they grow closer and closer, he’s reminded of his strong feelings for Jade, but can she return them? Let me just say, I don’t read a lot of contemporary romance books. I usually skip them over for suspense, action, dystopian, historical, etc. because sometimes they can be pretty boring. Dancing with Fireflies, however? Absolutely adorable! I loved the characters, the plot, the romance, the dialogue, and the CHARACTERS. Jade and Daniel were so cute and funny and I have to admit, I laughed out loud quite a few times. Jade’s family was adorable and I immediately fell in love with all of them! The story was so well balanced. It was serious and realistic, yet hopeful and romantic. Denise Hunter is a very talented author; she wove an inspirational tale of a woman learning to love again so well that it made me feel joy, sadness, and everything in between. 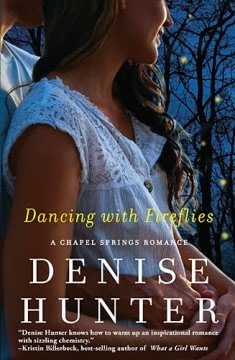 If you are looking for a book that makes you laugh, cry, or just plain happy, Dancing with Fireflies is it! It was inspirational, emotional, romantic, funny, and so very entertaining. I am very happy to add it to my bookshelf! **I received this book free from the publisher through the BookLook Bloggers book review bloggers program. All thoughts are entirely my own. Hi Rissi! I absolutely LOVE your blog! I watch a lot of the same tv shows/movies and read the same books. I really enjoy reading all of your reviews! Thanks for following my blog, too!